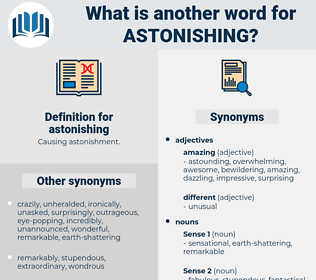 What is another word for astonishing? amazing, startling, staggering, astounding, mind-boggling, remarkable, stunning, surprising, impressive. fantastic, outstanding, awesome, odd, overwhelming, admirable, dreadful, dramatic, bizarre, horrifying, astonished, horrendous, terrific, horrific, paradoxical, miraculous, marvellous, hideous, unusual, astounded, whopping, splendid, egregious, unexpected, gruesome, daunting, exciting, curious, intimidating, marvelous, narcotic, formidable, terrible, enormous, immense, disturbing, awful, exceptional, horrible, troubling, great, noticeable, peculiar, heinous, atrocious, excellent, gorgeous, superb. dashing, Kidding, shocking, stupefying, stunning, striking. breathtaking, incredible, shocking, extraordinary, appalling, striking, alarming, perplexing, puzzling, unbelievable, strange, frightening, uncanny, spectacular, wonderful, phenomenal, tremendous, magnificent, surprised, disconcerting, outrageous, awe-inspiring. dull, boring, expected, insignificant, ugly, unimpressive, homely. enfeebling, unexceptional, tiring, weary, demoralizing, draining, monotonous, exhausting, wearying, wearing, wearisome, typical, dispiriting, unremarkable, tedious, disheartening, unsurprising, customary, uninspired, common, usual, debilitating, uninspiring, ordinary, enervating, mundane, normal, uninteresting, Jading, discouraging. Never mind, dear - it was only I. Dorman was some time believing this astonishing statement. The coincidence was certainly astonishing, but it was in Jones' favor.